Anyway, I have two more new designs to share with you today. Both are a type of jacket and my first two that have been generated on my clothing design software, so these have tissue pieces. I am excited to have conquered the set-in sleeve and raglan styles. It took some time and patience, but I got there! The first one I want to share with you is the Elise Jacket. It is a cropped style with a great gathered collar. I didn't realize how popular this collar is until I saw it EVERYWHERE on ready-made jackets after designing this little number. 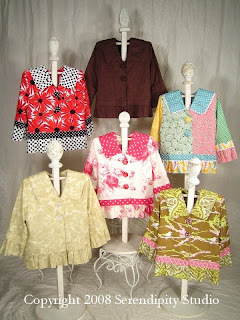 I also added a band and ruffle to the three-quarter length sleeves and hemline. 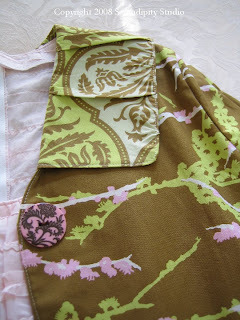 It is so fun to make this jacket because of the infinite possibilities of fabric combinations. I show it all buttoned up, but more than likely I will wear it open with a cute tunic underneath. 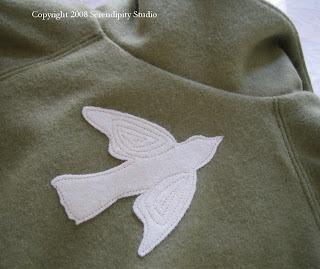 Surprisingly, it is EASY to sew and I can make one in an afternoon easily. So without further ado.....here it is! Getting back to the design.....it features a raglan sleeve that fits so beautifully because the sleeves are cut on the bias....they just flow down your arm and hang with perfection! I had a lot of fun with this design because it lends itself so well to heavier decorator weight fabrics. In fact, you have to use something heavier than regular quilting weight fabric or it just won't hang right when it is finished. 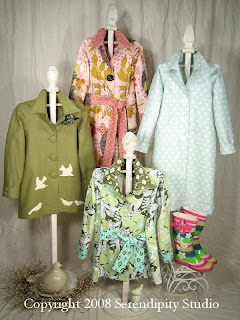 The green one in the photo is probably my favorite...that is Moda wool with the bird applique also from wool. It is just so lovely on! I can't wait for the Texas heat to be gone so I can actually wear it without breaking a sweat! 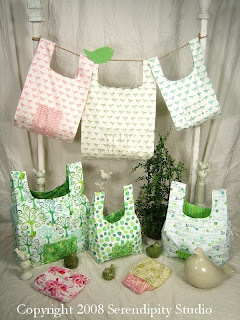 Again, these patterns will be available at the end of October once we get all of our ducks in a row for market. Let me know what you think of these and have a wonderful day! I'm Back, and this time, I mean it! Hello again, everyone! You will notice that I have once again fiddled around with the look of my blog. I guess one of these days, I will feel more comfortable with messing with the HTML code, but I do feel I am making some progress on that front. Let me know what you think of the new look! My absence from the blog this time is attributed to working hard getting ready for International Quilt Market in Houston next month. I have 6 new designs coming out, two of which you have already seen here on the blog....the Francesca Skirt, and the Juliet Tunic! Anyway, I made mention last time of a great little bag that is easy to make that I had been working out the details on. Here it is.....the Dharma Bag! It will be offered in three sizes on the pattern and the best part is that each size folds up into its own pocket, making it so easy to throw in the car or your bag when you go shopping! 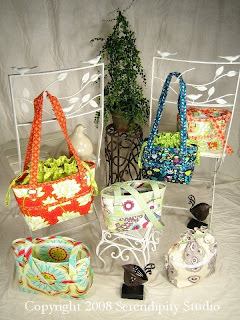 It is what I consider the best answer to going green....do it in style with your favorite fabrics!! Once your friends and family see this bag, they are all going to be begging for some.....so it is a darn good thing that these are so fast and easy to make! I also love that if you make a set, the bags will "nest" inside of each other, enabling you to carry three bags at once. I think they would make a great little Christmas gift! The other bag that I have designed for the fall is the Carmen Convertible Bag. This is one that I literally dreamed about one night and just knew I had to try it out. This design is featured in two sizes, a handbag and small tote. It has comfortable shoulder straps and is quite roomy to hold all of your stuff. That is definitely a good thing, as you are going to love how this bag works! I designed a removable drawstring liner that will pull out and plop into another bag, so you don't have to go through all of your junk when you are in a hurry and just need to change to a different bag! So the idea here is to make several "outsides" to go with the liner, then you can have a totally different bag without dumping out the contents and dealing with "all of that" when you don't have the time or energy. The bag also stands alone nicely, as it is fully lined on its own. The removable liner is held in place with a long strip of Velcro. I added interior pockets to the liner as well to help keep everything organized. The exterior pockets will also help with that! I had mentioned Peltex in my previous post and how I wanted to give it a try. I REALLY like this stuff! It is easy to sew through and holds its own very well. I chose to use the one that is fusible only on one side, so the product is officially Peltex 71. Give it a try if you are so inclined....I have even made a Bridget Bag (which I think I mentioned last time) to try this product. I love the results and highly recommend using it! I truly feel that it is a great substitute for my beloved buckram. In some ways, (and don't tell anybody) I like it better! I feel in the long run it is going to hold its shape without softening, and it says it is washable. While I still feel that is not the best idea in the world, you should be able to do it if you absolutely must. So go forth and use this stuff with my blessing on any of my bag designs! The new designs will all be available at the end of October. I am excited about them and hope you will be too. I will be making an attempt to regularly post, now that most of the craziness of designing has been done. I still have a lot to do before being ready for market, but the hardest part is done....whew! Hope you all are having a fabulous day and enjoying the fall weather, wherever you are!